The United States hardliners appear to be dragging the country to a point of no return when only two scenarios with regard to Russia will remain possible, a stalemate or a catastrophe, warns foreign affairs expert Patrick L. Smith. "Either we are on the near side of open conflict between two great powers, accidental or purposeful and probably but not necessarily on Ukrainian soil, or we are in for a re-rendering of the Cold War that will endure as long as the original," Smith asserted. Ukraine is at the heart of this process. It did not have come to this. On the contrary, the Obama administration seemed to have come to its senses when State Secretary John Kerry came to Sochi in May. The visit could have marked the moment when the US finally accepted the peaceful resolution of the Ukrainian conflict as the only viable option. It has not happened so far and is unlikely to change in the future, for it would require Washington to "accept a settlement that federalizes Ukraine, as Europe and Moscow assert is sensible," Smith wrote in an opinion piece for Salon. The bipartisan war party in the US will make everything possible to prevent this from happening. It has doubled its efforts to escalate the civil war in Ukraine since the Minsk II agreements were signed. US Senator John McCain visited Kiev as part of a campaign to undermine the Minsk peace process. He used the opportunity to shame Europeans for not doing enough for Ukraine's army. "McCain is one of those many on Capitol Hill who have no clue where shame lies in Ukraine. 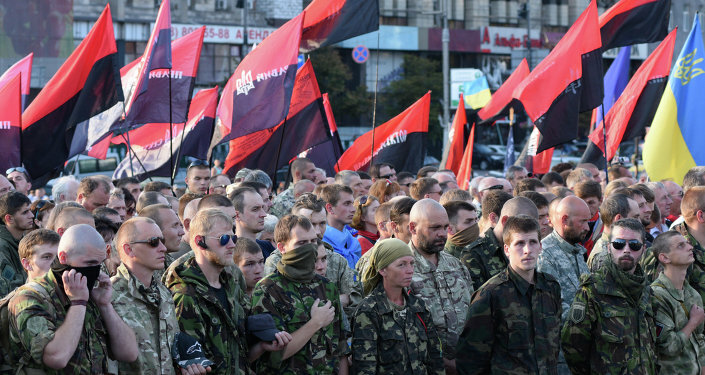 A coup Washington cultivated, producing a patently incompetent administration in Kiev openly dependent on violence-worshipping Nazi nostalgists? Six thousand dead and counting? A purposeful and absolutely pointless revival of tensions across Russia’s western borders? No shame here, Senator?" Smith asked. The hardliners seem to have plenty to celebrate. The US is committed to training Ukrainian forces and will send Kiev additional defensive weapons. Meanwhile, Washington is also increasing pressure on Moscow through NATO. Soldiers from NATO countries attend an opening ceremony of military exercise 'Saber Strike 2015'. The North Atlantic Alliance is enhancing war-games close to Russia's borders. While iIt carried out fewer than 100 military drills in 2014, which according to the analyst is "already an aggressive number," it plans to conduct more than 150 this year. "Reconnaissance flights and airborne exercises bumping up to Russian airspace have increased nearly tenfold," Smith pointed out. 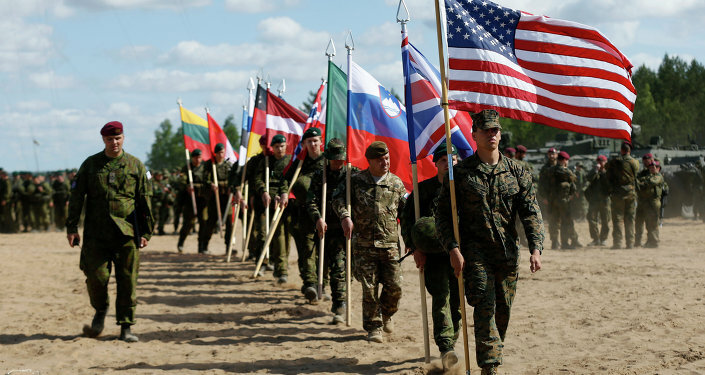 NATO officials love to say that the bloc's muscle flexing is purely defensive but "who is this fig leaf intended to fool, you have to wonder," Smith noted, adding that "Russia's perception of a NATO threat on its borders is altogether realistic."